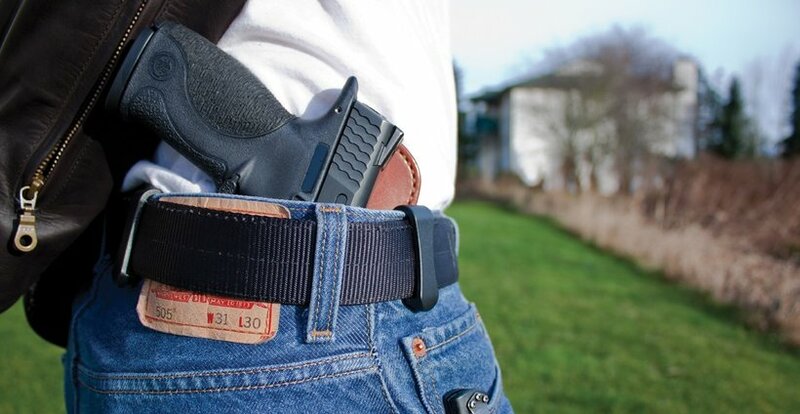 MONTGOMERY, Ala. — “Campus carry” may be coming to Alabama in 2016. A state lawmaker has pre-filed a bill for the upcoming legislative session that would ensure the right of college students who obtain a concealed carry permit to conceal a pistol while at school. The bill would also allow colleges to “establish rules concerning the storage of pistols in dormitories” and empower university presidents to impose “reasonable rules” and “certain limitations” with regard to concealed carry on campus. Additionally, colleges would not be held liable for any “damages caused by an action” authorized by the bill, unless that action is taken by a university officer or employee. The bill was pre-filed by State Representative Mack Butler (R-Rainbow City), who is also a trained law enforcement officer, and will be debated by the legislature when the body reconvenes next month. If passed by the full legislature, a Constitutional Amendment would then likely appear on the ballot in November for approval by the citizens of Alabama. Butler added that his bill is similar to one passed in Texas last year. But unlike Texas, which requires concealed carry permit holders to be at least 21 years old, the age requirement to obtain a permit in Alabama is only 18. This means a far greater number of students would be allowed to carry on campus, if Butler’s bill — and the subsequent Constitutional Amendment — was to pass. This bill would propose an amendment to the Constitution of Alabama of 1901, to allow a concealed pistol permit holder to carry a concealed pistol upon his or her person while the permit holder is on the campus of a public institution of higher education or a private institution of higher education. The amendment would allow public institutions of higher education or private institutions of higher education to establish rules concerning the storage of pistols in dormitories or other residential facilities that are owned or leased and operated by the institution and located on the campus of the institution and located on the campus of the institution and to further limit the carrying of pistols on campus under certain conditions. This amendment would also provide immunity for public and private institutions of higher eduction from damages arising from action or inaction under the requirements of the amendment, with certain limitations. While public universities would not be allowed to completely ban weapons, they would be able to draft “reasonable rules” with regard to campus carry. This means that universities could ban concealed carry in certain situations, such as large sporting events where security screenings take place prior to entry. Private colleges would have more latitude to prohibit guns, because of their private property rights. Several of Alabama’s largest college campuses do not currently allow concealed carry. Cathy Andreen, director of media relations at the University of Alabama, said in 2014 that UA’s decision to prohibit guns on campus is an effort to keep students safe. “Our policies are designed to help make sure our campus is a safe place for our students, employees and visitors to live, learn, work and visit,” she said. “UA believes that its policies and procedures comply with the state law. Auburn, UAB, South Alabama, and numerous other public institutions have similar policies. As a result, campus carry groups have popped up at college’s around the state in recent years, particularly as mass shootings on college campuses have become more widespread. Campus carry advocates often point to Colorado as evidence that empowering students, faculty and staff to concealed carry at colleges is a safe and powerful crime deterrent. Campus carry has been the law of the land in Colorado since 2003 and there have not been any mass shootings or crimes by permit holders. There were a total of 23 shootings on college campuses in 2015, the most deadly of which took place at Umpqua Community College in Roseburg, Oregon, where 9 were killed and 9 more injured. Now that it’s 2019, no longer does the term “Sweet Home Alabama” have to be just a famous Lynyrd Skynyrd song, or a Reese Witherspoon romantic comedy. That’s because anyone who has always wanted to own a home of their own in Alabama now has a new tool to help them do that for the first time, or even the first time in a long while. In Alabama, the First-Time Homebuyer and Second-Chance Savings Account (FHSA), is now available for anyone who has never owned a home or for those folks who are re-entering the housing market and haven’t owned a home for at least a decade. Individuals or couples can open one of these tax-free savings accounts at any local bank, credit union or other financial institution in Alabama. The principal deposits and earnings will be deductible on their state income taxes. The savings in this account can be used to pay for a down payment and/or closing costs for a single-family dwelling. The option to use this account was created in 2018 when the Alabama legislature passed a bill and Gov. Kay Ivey signed it into law. It allows individuals or couples to make deposits and earnings up to $50,000, with a mandate that qualified expenditures must be made within five years from opening the account. And while this benefit is great for the first-time homebuyer and those who may have had to hit the reset button for a time and are ready to own a home again now, it’s a benefit to all Alabama residents. Even though other Alabamaians can’t take advantage of the FHSA, they benefit because home ownership helps improve neighborhoods, which in turn attracts businesses, which creates jobs and improves our local economy. Homeownership provides wealth accumulation for owners, in addition to social and economic benefits. Overall, 90% of Alabama residents believe homeownership is a good financial decision. So, there’s a stake in homeownership for everybody in Alabama, where, according to the song, the skies are so blue. And those skies will be bluer and brighter with more homeowners, which is why those that qualify should take advantage of the FHSA now that it is available.